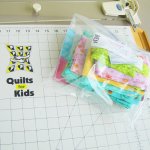 Kit contains pre-cut fabric for the enclosed pattern, backing, and a QFK label. You supply the thread, batting and the love. Remember, all quilts made from kits MUST be returned to headquarters! PLEASE ALLOW 10 TO 14 BUSINESS DAYS FOR KIT DELIVERY. Your generous donation helps us ship quilts to the children who need them.